Paleontologists at the University of Toronto (U of T) and the Royal Ontario Museum (ROM) have uncovered a new fossil species that sheds light on the origin of mandibulates, the most abundant and diverse group of organisms on Earth, to which belong familiar animals such as flies, ants, crayfish and centipedes. The finding was announced in a study published today in Nature. The creature, named Tokummia katalepsis by the researchers, is a new and exceptionally well-preserved fossilized arthropod - a ubiquitous group of invertebrate animals with segmented limbs and hardened exoskeletons. Tokummia documents for the first time in detail the anatomy of early "mandibulates", a hyperdiverse sub-group of arthropods which possess a pair of specialized appendages known as mandibles, used to grasp, crush and cut their food. Mandibulates include millions of species and represent one of the greatest evolutionary and ecological success stories of life on Earth. "In spite of their colossal diversity today, the origin of mandibulates had largely remained a mystery," said Cédric Aria, lead author of the study and recent graduate of the PhD program in the Department of Ecology & Evolutionary Biology at U of T, now working as a post-doctoral researcher at the Nanjing Institute for Geology and Palaeontology, in China. "Before now we've had only sparse hints at what the first arthropods with mandibles could have looked like, and no idea of what could have been the other key characteristics that triggered the unrivaled diversification of that group." 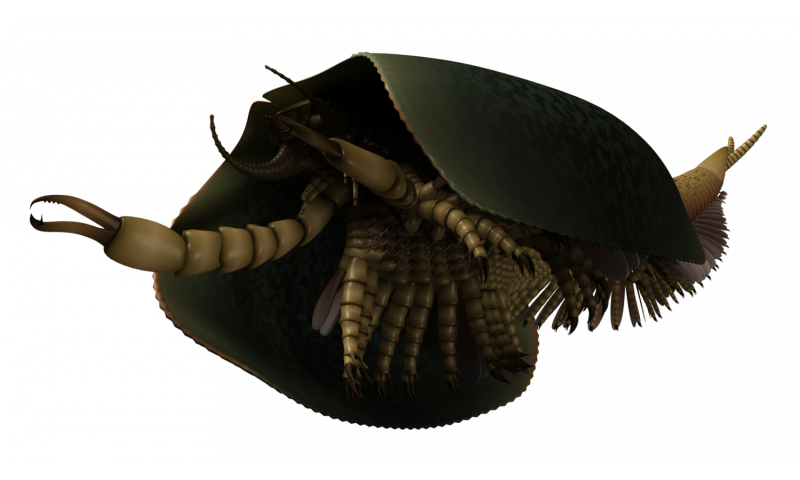 Tokummia lived in a tropical sea teeming with life and was among the largest Cambrian predators, exceeding 10 cm in length fully extended. An occasional swimmer, the researchers conclude its robust anterior legs made it a preferred bottom-dweller, as lobsters or mantis shrimps today. Specimens come from 507 million-year-old sedimentary rocks near Marble Canyon in Kootenay national park, British Columbia. Most specimens at the basis of this study were collected during extensive ROM-led fieldwork activities in 2014. 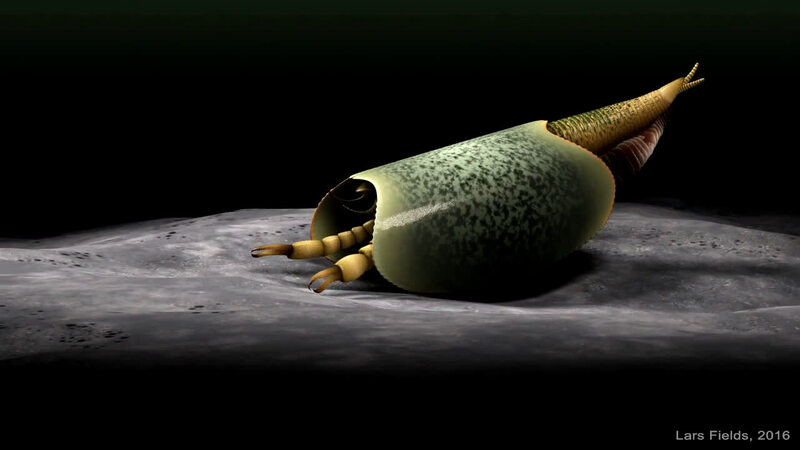 "This spectacular new predator, one of the largest and best preserved soft-bodied arthropods from Marble Canyon, joins the ranks of many unusual marine creatures that lived during the Cambrian Explosion, a period of rapid evolutionary change starting about half a billion years ago when most major animal groups first emerged in the fossil record," said co-author Jean-Bernard Caron, senior curator of invertebrate paleontology at the ROM and an associate professor in the Departments of Ecology & Evolutionary Biology and Earth Sciences at U of T.
Analysis of several fossil specimens, following careful mechanical preparation and photographic work at the ROM, showed that Tokummia sported broad serrated mandibles as well as large but specialized anterior claws, called maxillipeds, which are typical features of modern mandibulates. "The pincers of Tokummia are large, yet also delicate and complex, reminding us of the shape of a can opener, with their couple of terminal teeth on one claw, and the other claw being curved towards them," said Aria. "But we think they might have been too fragile to be handling shelly animals, and might have been better adapted to the capture of sizable soft prey items, perhaps hiding away in mud. Once torn apart by the spiny limb bases under the trunk, the mandibles would have served as a revolutionary tool to cut the flesh into small, easily digestible pieces." The body of Tokummia is made of more than 50 small segments covered by a broad two-piece shell-like structure called a bivalved carapace. Importantly, the animal bears subdivided limb bases with tiny projections called endites, which can be found in the larvae of certain crustaceans and are now thought to have been critical innovations for the evolution of the various legs of mandibulates, and even for the mandibles themselves. The many-segmented body is otherwise reminiscent of myriapods, a group that includes centipedes, millipedes, and their relatives. "Tokummia also lacks the typical second antenna found in crustaceans, which illustrates a very surprising convergence with such terrestrial mandibulates," said Aria. The study also resolves the affinities of other emblematic fossils from Canada's Burgess Shale more than a hundred years after their discovery. 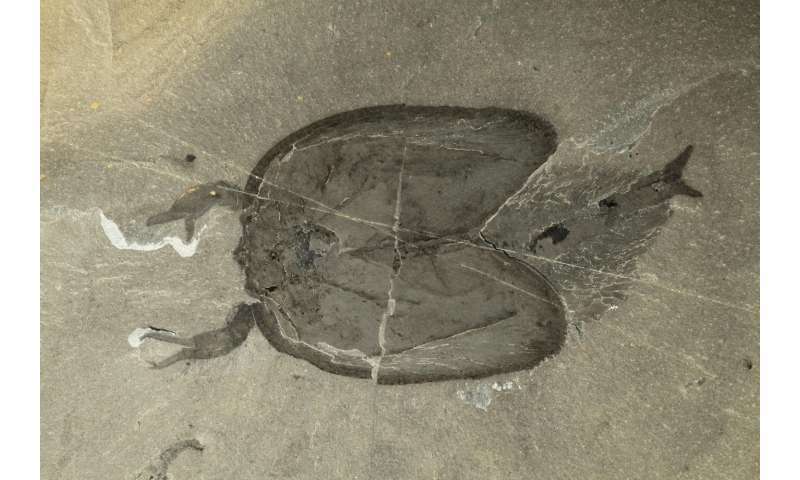 "Our study suggests that a number of other Burgess Shale fossils such as Branchiocaris, Canadaspis and Odaraia form with Tokummia a group of crustacean-like arthropods that we can now place at the base of all mandibulates," said Aria. The animal was named after Tokumm Creek, which flows through Marble Canyon in northern Kootenay National Park, and the Greek for "seizing". The Marble Canyon fossil deposit was first discovered in 2012 during prospection work led by the Royal Ontario Museum and is part of the Burgess Shale fossil deposit, which extends to the north into Yoho National Park in the Canadian Rockies. All specimens are held in the collections of the Royal Ontario Museum on behalf of Parks Canada. The Burgess Shale fossil sites are located within Yoho and Kootenay national parks in British Columbia. The Burgess Shale was designated a UNESCO World Heritage Site in 1980. Parks Canada is proud to protect these globally significant paleontological sites, and to work with leading scientific researchers to expand knowledge and understanding of this key period of earth history. New information from ongoing scientific research is continually incorporated into Parks Canada's Burgess Shale education and interpretation programs, which include guided hikes to these outstanding fossil sites.